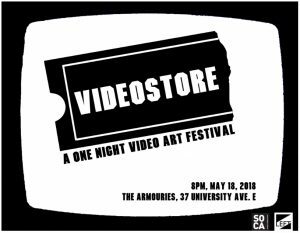 VIDEOSTORE is a one night DIY video art festival, based off the widely successful Bring Your Own Beamer events produced by Rafaël Rozendaal. The festival is currently seeking submissions of video art, and is open to all participants on the condition that they provide their own projector, monitor, installation equipment, etc. Artists must be present for and prepared to install and de-install their work on May 18, 2018. The event will take place in Windsor, ON.